Oh boy, we haven't ventured down this corner of Havelock since our awkward Club Momo days – have we given our ages away now? 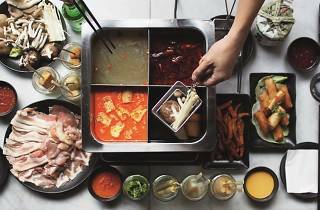 – but Magazine Road now boasts 'Singapore's hottest hot pot'. Miss Lok, she's called, is a grungy gal with metal pipes for bones and punny phrases like 'Love you dip dip' scrawled, in neon, like lipstick on chipped brick walls. Step inside, though, and you'll find her personality's as stale as a Tinder conversation gone cold. Sure, she looks good, but the air is dead with whisper levels of saxophone music that make you feel almost hesitant speaking after knocking back a few bottles of the Asian beers ($12-$18/bottle, $45-$60/bucket of five), sake ($16-$22/glass, $35-$75/bottle) or wine ($14-$16/glass, $60-$75/bottle) on offer. Still, we're here because we've heard she's brought the Malaysian roadside supper staple to a new, hip and sanitised format. Jars holding up colour-coded sticks of standards like quails eggs, vegetables, and fish paste ($1-$4) in many shapes parade lazily on a sushi conveyor belt steps away from the entrance, but at prices many times more expensive than their counterparts north of the Causeway. Of course, you're paying for the atmosphere and the extensive sauce bar, which stocks more than the usual garlic and soya suspects – there are peanut butter and prickly nam phriks on hand to accent the dippers. The other part of the lok-lok equation, the soup, comes with eight flavours ($8 each) that simmer over induction burners on each table. The recommended Singapore ba kut teh is a light herbal broth with a bonus basket of pork belly, and the dashi-based Japanese oden is a neutral-enough canvas to help both the fresh seafood ($36) and meat ($18-$36) platters shine with their own merit. The exhortation to try the Singapore laksa is best ignored as coconut milk hardly thrives sitting on constant heat – it's not long before milk fat starts to scorch at the bottom of the pot for four. Maybe we'll come by for a second date, we muse, as we chug down our beers a little too fast to escape the awkward silence. The spread isn't bad, and we can definitely fill up on sides like the Thai-style kang kong, battered and deep fried ($10). 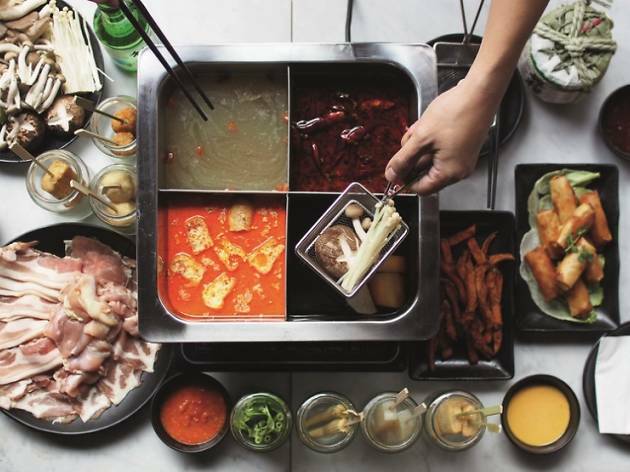 We might even come by for a hot pot bling, late night when we need some lok-lok. But she's also a high-maintenance kinda girl, so we might just do our flirting elsewhere.